This week will be the first of the final three weeks of the second season of Rebels with “The Forgotten Droid,” airing on Wednesday, March 16, to be followed a week later by “The Mystery of Chopper Base.” On March 30th, we then get the two part season finale, “Twilight of the Apprentice,” and then the long wait until the start of Season Three, which will likely air in the fall of 2016. Concerning what to expect in Season Three, Disney has already stated, “Following a series of critical events, the lives of our heroes will be changed forever as season three begins.” Undoubtedly, the critical events which will change the lives of our band of rebels will occur in the season finale. But what will those events be? A prevailing, if not happy theory, is that Ahsoka Tano will face her former mentor and friend, Anakin Skywalker a la Darth Vader, and be killed by the Sith Lord. Courtesy a mid-season trailer for the back half of Season Two, we know the two will face off in a lightsaber duel (see below for the images), but we don’t know what the end result will be. Prior to Tano’s return to the small screen on Rebels, her fate was an enduring mystery following her departure from The Clone Wars when she quit the Jedi Order. Many a fan wondered and feared, “Did Ahsoka survive the Dark Times?” Indeed, the Original Trilogy all but explicitly states that by the time Yoda passes mid-film in Return of the Jedi, Luke Skywalker is the last of the Jedi. While this broods ominously for Kanan Jarrus and Ezra Bridger, in our most recent Rebels episode, “Shroud of Darkness,” Ahsoka specifically refers to herself as not being a Jedi. This might imply that she won’t share the same fate as so many other Force users. Of course, just because she’s no longer officially a Jedi, it’s not to say that she will be spared when confronting Vader. The duel between Tano and Skywalker will undoubtedly go down as the third most significant duel in Darth Vader’s visual history, if we consider his two duels with his son Luke. (Sorry, Obi-Wan, Lucas failed to bring the real emotion needed for your duel with your padawan in Revenge of the Sith – Ahsoka Tano bumps you down to fourth.) We have several things to consider concerning this upcoming confrontation, first is David Filoni’s own affection for Ahsoka Tano. 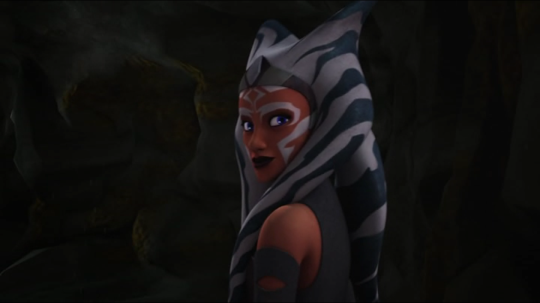 Ahsoka is very much a creation of the The Clone Wars and Rebels showrunner, and Filoni even made a point of drawing Ahsoka through her various incarnations from young Tano to her present appearance as part of the media introduction to Season Two. Will he find it in himself to sacrifice her on the altar of storyline and Darth Vader/Anakin Skywalker’s own character development? Another consideration is Ahsoka’s codename in Rebels, before she was revealed at the end of Season One, Fulcrum. A fulcrum may be defined as the center point upon which something rests or balances. There’s a hint in Ahsoka’s vision of Anakin in “Shroud of Darkness,” that she might have been the balancing point that kept Anakin from turning to the Dark Side, and hence, her departure resulted in his downfall. But more to the point, it’s hard to understand what role as a balancer, so to speak, she plays in Rebels concerning the general rebellion against the Empire. At best, her efforts could be seen to have helped the nascent rebellion from being permanently destroyed, but perhaps Fulcrum is a hint back to her future confrontation with Darth Vader. 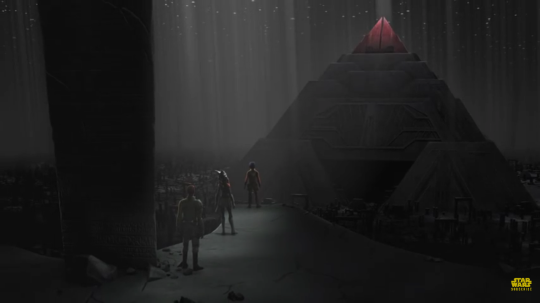 Again, returning to “Shroud of Darkness,” Ahsoka’s vision, while extremely upsetting for the former Jedi, concluded with her rising to her feet and affirmatively declaring, “There’s another way.” Let’s quickly consider Darth Vader at this time and place. He has been a ruthless servant of the Emperor for almost two decades and we are only two to three years away from his appearance in A New Hope. It’s well established from Revenge of the Sith and the new rapidly growing Expanded Universe that he is a Sith capable of repeated atrocities and ruthlessness. So we know that Vader is not ‘balanced’ in any meaning of the word, but what if to become the servant of the Empire that Luke Skywalker confronts and feels ‘the good’ inside, he needs something to happen? What if he needs to be rebalanced to make him susceptible to his son’s overtures? What if Ahsoka Tano will serve as that new fulcrum and find another way to stop Vader or push him into the right place for the future? The main problem, for those who want to see Tano continue breathing, is that she could serve such a purpose and still die at the hands of Darth Vader. After all, the Vader of A New Hope is still the Vader who without hesitation cuts down his former friend and master, Obi-Wan Kenobi. Who matters most? Kenobi or Ahsoka? We have been told by Disney that a critical event will change the lives of the rebels for Season Three, but would the death of Ahsoka Tano be such a critical event? Or perhaps, maybe the seduction to the Dark Side of Ezra Bridger? We have previously talked about the possibility of Ezra succumbing to the Dark Side, mainly in a quest for power to protect his friends and fight the Empire, so we will not go much in length here (except to quickly examine the images from the mid-season trailer). 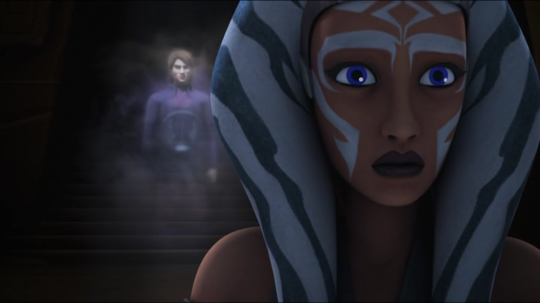 Nonetheless, as much as Ahsoka Tano means everything to many Star Wars fans, her death would not affect the crew of the Ghost nearly as much as losing Ezra to the Dark Side. Does this still mean Ahsoka could perish? Absolutely, but it does at least provide a chance that her death is not an absolute itself. 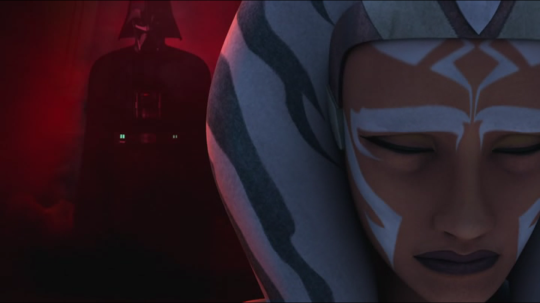 Ahsoka Tano’s fate aside, we have a good idea of how the final two episodes, parts one and two of “The Twilight of the Apprentice” will likely proceed given the nudge forward by “Shroud of Darkness.” We will look delve into that in part two of this post.